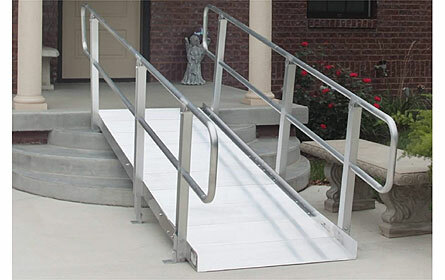 The OnTrac wheelchair ramp is the perfect solution when you have 1-2 steps and need the extra safety of handrails. The elderly are particularly susceptible to losing their balance when on a ramp if they do not have handrails to hold. A person in a manual wheelchair can also benefit from the handrails by using them to pull themselves up the ramp. The most attractive benefit is that a wheelchair cannot go over the side with the handrails installed. The load rating for the Ontrac ramp is 850 pounds and the width is 36 inches. If you need a commercial ramp with handrails please see either the Modular Ramp page for ramps with a rise of under 30 inches or the Commercial Ramps page for ramps with a rise greater than 30 inches or if the ramps are to be used in California or Massachusetts. Since 2002, our commitment to customer service has been the key to our success. Our business depends on your complete satisfaction.